Persecution Podcast has just delivered episode #2. This week Todd, Mark & Mary Sue discuss Saudi Arabia and Indonesia. The show is available for download at http://www.persecutionpodcast.com. I was just in Australia two weeks ago and so when I saw this story about Australian Christians walking to bring bibles to persecuted believers, I couldn't pass up sharing it with you. On August 6, just two days before the Olympics began, Pastor Zhang "Bike" Mingxuan was arrested, along with his wife and a coworker. In response to these arrests, The Voice of the Martyrs and China Aid Association have launched a petition drive to free these three Christians and to let the Chinese government know that the world is aware that these Christians are being detained. Pastor Bike, as he is affectionately known, is considered to be one of the most outspoken evangelists in China. He is a bold believer willing to cross borders, hand out Christian literature and Bibles, share Christ with those under age 18 and lead thousands to Christ. All these actions are considered "illegal," in communist China. 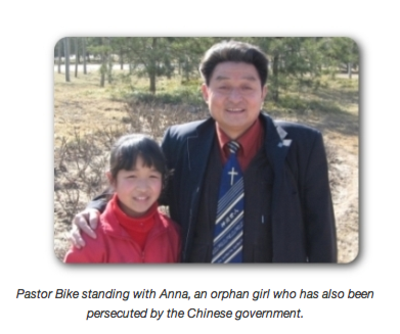 Earlier this year, Pastor Bike pleaded with VOM staff and China Aid Association to create the China Prayer Bands so that Christians in the free world could know more about persecution of Christians in China. On August 23, widespread violence erupted against Christians following the assassination of World Hindu Council leader Swami Lakshmananda Saraswati, the alleged mastermind behind the December 2007 attacks on believers in Kandhamal, Orissa State. Saraswati was killed with four of his followers. 30 men believed to be Maoist extremists, stormed a religious center in Kandhamal and opened fire, VOM contacts reported. “Despite evidence indicating that Maoists are responsible for Saraswati’s murder, several Hindu militant groups have blamed Christians,” VOM contacts said. “As a result, Hindu militants have launched attacks on Christians throughout the state, setting buildings on fire and beating and killing believers in at least 12 districts. The Voice of the Martyrs has been receiving numerous reports on this developing crisis. At present, it is difficult to know the full extent of what is happening to Christians in Orissa State. VOM contacts reported churches, mission buildings and schools throughout the state have been damaged or destroyed in the attacks. In the village of Nuagaon, Kandhamal district, extremists set fire to a social centre in the village after violating a nun who was at the facility. The Bethel Association, a Christian orphanage in the district of Rayagada, was burned to the ground. The mission was home to 150 children, many of them from families who have suffered persecution for their faith. In Bargarh district, another orphanage was torched and a young woman was burned alive after she was thrown inside the building when she tried to protect the children. At least 20 churches have reportedly been destroyed, but the extent of the damage in Orissa State has not been ascertained as reports continue to be released from the affected regions. VOM contacts report more than 50 homes belonging to Christians have been reportedly burned to the ground by extremists in the village of Rupagaon, Kandhamal alone. \“A paralyzed man was unable to escape his burning house and was killed. Houses have also been ransacked, pelted with stones and vandalized throughout the state. Christian-owned shops have been torched and looted. Many Christians have fled their homes and are seeking refuge in the jungle. Although police have attempted to protect Christians and end the attacks in Orissa, the violence has continued to occur. Militant groups have blocked roads with logs in order to keep the police away. Christian groups continue to beseech government authorities to intervene and end the violence,” VOM contacts added. Similar attacks erupted on Christmas Eve 2007 after Hindu extremists targeted Christian homes and churches. Four Christians were killed, many injured and numerous homes and churches destroyed or damaged in the violent clashes that lasted five days. More than 18 churches and prayer houses were ransacked and torched in several areas of Kandhamal district in Orissa. In the past Hindu extremists have used anti-conversion laws to terrorize Christians. VOM is working to gather information on these attacks and provide assistance to believers affected. Following the December attacks VOM provided assistance, by distributing thousands of Bibles and supporting some families that lost loves ones during the attack, through VOM’s Family of Martyrs fund. VOM encourages you to continue praying for believers affected by the attacks. Ask God to protect believers who facing great challenges. Thank God for their faithfulness, and ask Him to provide for their needs. This week it feels like the Lord has got me thinking about age and the blessings He gives us as His children. Two chance encounters this week piqued my interest on the importance of staying involved in ministry irrespective of our age. I have been meditating on the scripture in Psalms 91:16, that promises that the Lord will satisfy us with long life, and how vital it is to give our time and extend God’s kingdom. I was reminded of this scripture when a couple that volunteers here at The Voice of the Martyrs shared with me that the husband had celebrated his 80th birthday this past weekend. Wow! What a blessing. This precious couple has served persecuted believers for years, while they continue to live active, full lives. After speaking to them, I was struck by their commitment to VOM and serving persecuted brothers and sisters around the world. I personally know that, apart from coming into the office and volunteering in different capacities, they pray for persecuted believers and have a heart for suffering Christians around the world. The day after reflecting on this couple, I met an amazing 85-year-old lady who has mailed 300 Bibles to China through VOM’s Bibles Unbound program, since March of 2006. When I asked her what led her to get involved with the program, she recalled, with tears in her eyes, attending a missions meeting and hearing someone share she could ship Bibles overseas for only $30. What touched her heart was that she would provide God’s Word to people who had no access to Bibles, because either their governments did not allow them to have Bibles or Bibles were not easily accessible. She said as soon as she heard the 10-minute talk she knew the Lord was leading her to commit herself to sending Bibles to China. As I spoke to this wonderful lady, I was touched by her genuineness and desire to serve the Lord, to be His hands and feet and play a part in serving persecuted believers who do not have access to Bibles in China. She also told me that as she watched the Olympics during the past two weeks and saw the 91,000 people in the “Birds Nest” stadium in Beijing, she wondered whether any of the people in the stadium were the individuals to whom she had sent Bibles. Another incredible thing about this lady is her commitment to pray every night for the people who received her Bibles. She acknowledges that her time on this earth is short, but she believes one day when she gets to heaven, she will meet the many believers she blessed with Bibles. To her it is all worthwhile. She is blessed to do it and to be involved with VOM. These chance encounters this week have encouraged me and reiterated the statement that age is nothing but a number. I want to be as active as these precious believers, serving the Lord in my 80s. If you are not involved in serving our persecuted brothers around the world, I encourage you to be inspired by these believers, who in their senior years are still part of Christ’s Great Commission to preach the gospel into the ends of the earth. 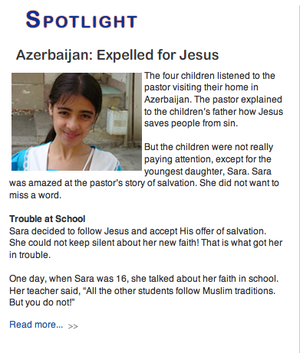 Visit www.persecution.com to learn how you can become involved in serving the persecuted church. Our partners at Release International sent out a unique “prayer-a-day” for the month of August. This has something you can pray for China for every day in August. I encourage you print this out and use these prayers each day. You can start any day you like. It will only take a few minutes, and imagine how you can impact the world by bringing China before our all-powerful God. Here are the prayers for Day 27 through Day 31. Some house church leaders are misinterpreting the Bible and leaving their families behind to serve the Lord. They want to respond to China’s urgent need for Christian ministers – but they may pay a heavy personal price: family breakdown. Pray that church leaders in China will find the right balance between family priorities and spreading the good news. Cai Zhuohua, a house church pastor from Beijing, was jailed between 2004 and 2007 for distributing Bibles for free in poor areas where people could not access Bibles or could not afford them. The Chinese government recently held an exhibition in the US to try to prove that China not only has sufficient Bibles but is a major exporter of them. Pray that God will provide sufficient Bibles to meet the needs of believers in China. Jiang Zongxiu, 34, was beaten to death in 2004 for carrying Scriptures: she left behind an eight-year-old son. Her family is still waiting for justice: Jiang’s body has not been returned to her family and her attackers have not been punished. Pray that Jiang’s family will be comforted by the love of Christ and will see justice done. Despite its recent economic downturn, China is the world’s fastest-growing economy – a position which carries considerable political clout. Pray that, while much of the international community courts this emerging superpower, nations of influence will continue to put pressure on Beijing to clean up its human rights record in the future. The Beijing Olympics have inspired churches and believers all over the world to pray for China. Pray that this prayer campaign will gather momentum and that the Lord will bring revival to the nation of China. Keep on praying for breakthrough in China! Help Free Pastor Bike - Sign Our Petition Today!!! Click here to read the rest of this great story. MADISON, Wisconsin, Aug. 25 /Christian Newswire/ -- Starting in 2006, 4 Winds Christian Athletics distributed the testimonies of Olympic track and field athletes worldwide, including in the underground Chinese church. Outside groups that work with the underground church asked to take the testimonies into the underground church, estimated to be over 100 million people according to China Aid and the Voice of the Martyrs. Four of the athletes whose testimonies were consistently distributed won five Olympic medals: Stephanie Brown Trafton (discus gold), Bryan Clay (decathlon gold), Allyson Felix (200m silver, 4x400m gold), and Nick Willis from New Zealand (1500m bronze). Stephanie and Nick were not expected to gain medals according to the experts. 4 Winds never wavered through the year leading up to the Olympics. In November, when a rumor circulated about Bibles being banned in the Olympic village, 4 Winds took a stand and was quoted in an article from the Associated Press, saying banning Bibles would be a "deep violation." Then in May, 4 Winds took another stand when Franklin Graham preached in the Chinese government's Three-Self Patriotic Movement church and then told people they should not evangelize during the Olympics. Steve McConkey, 4 Winds president, told Reuters, "Christians should use caution and do as God leads" in China during the Olympics. The Three-Self Patriotic Movement churches have thirteen seminaries that teach Marxist liberal theology. The athletes who won medals shared after their performances. Stephanie Brown Trafton told NBC after her gold medal win in the discus, "I was singing a gospel song based on the Bible verse Joshua 1:9. This verse actually carried me to a winning toss and I knew that whatever happened at the end of the day I was not afraid of loss or success. Winning or coming in 10th place did not determine my worth as a person, but my worth in God's eyes is much more than a gold medal." Steve McConkey believes that we should not forget the Christians in China, "We need to keep these people in our prayers and support organizations that help them." 4 Winds Christian Athletics is an evangelistic and teaching ministry in track and field. They offer a website that covers current track and field news. More importantly, 4 Winds operates the first sports apologetic news site called subterraneanNEWS. This part of the website gives people current news and articles countering cults and beliefs that are contrary to Christianity. Recently, a Saudi member of the religious police cut his daughter’s tongue off and burned her to death for converting to Christianity. The father, who works for the Commission for Promotion of Virtue and Prevention of Vice, killed his daughter following a debate on religion, according to a report by the United Arab Emirates-based Gulf News. Media organizations in Saudi Arabia are reporting that the victim wrote a blog under the name "Rania" a few days before her murder. According to the Saudi Arabia Ukhdoud news website, the victim wrote that her life became an ordeal after family members grew suspicious about her after a religious discussion with them. She said her brother found some Christian articles written by her as well as a cross sign on her computer screen. Since then he started to insult her and blamed the Internet for pushing her to change her religion. Gulfnews.com reported. "Our contacts have told us of new Christians simply disappearing when their families learned of their conversion," said Todd Nettleton, Director of Media Development for The Voice of the Martyrs, "but now even Arab media outlets confirm the violent response of radical Muslims to Christianity. We pray that someday this man will come to know Christ, and find forgiveness for ending his daughter’s life. Our hope is that someday he will see his daughter again, in heaven." The Voice of the Martyrs supports the evangelism efforts of Christians in Saudi Arabia, despite the great cost. "We call on Christians everywhere to pray for believers facing intense persecution in Saudi Arabia because of their faith," said Nettleton. "Pray God will encourage them and give them boldness to stand up for Christ."